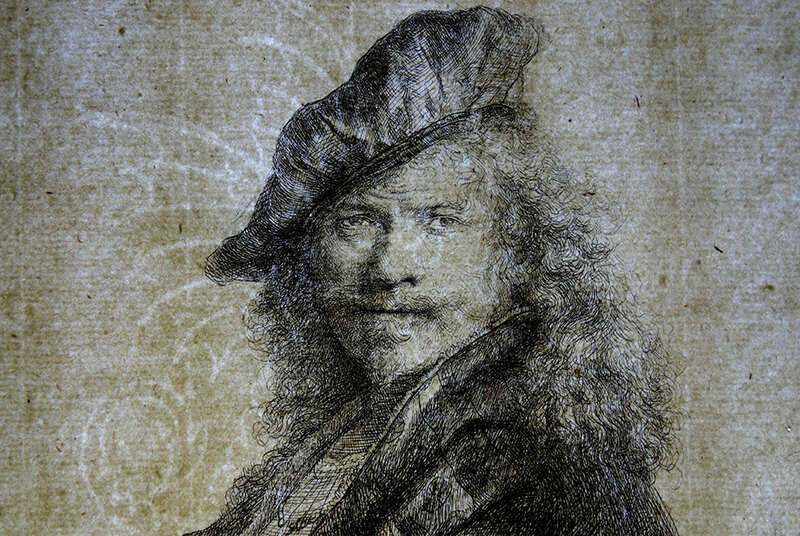 Treasured for their technical innovation and perceptive portrayal of the human psyche, Rembrandt’s etchings in university and college art collections in the United States have long inspired curatorial research, technical investigation, and multidisciplinary teaching approaches. 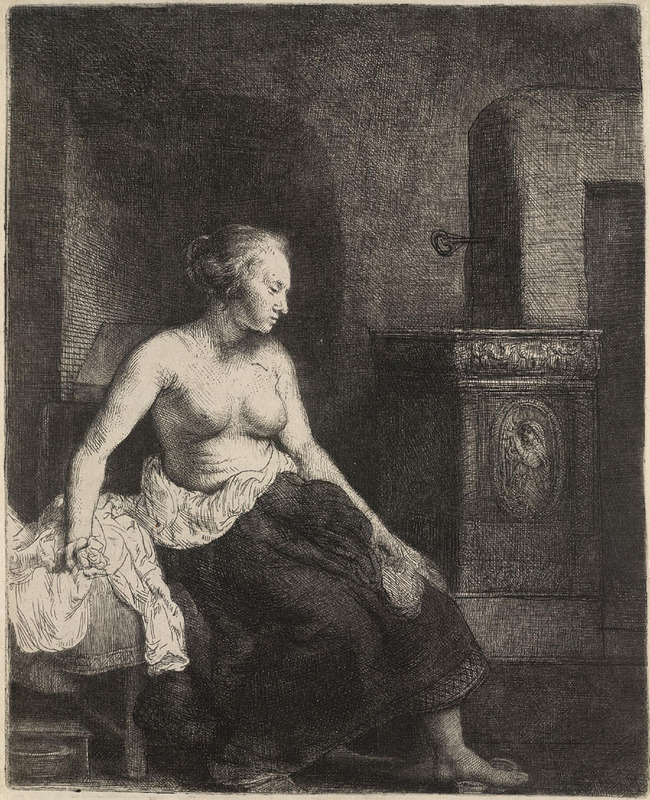 This exhibition examines the scope and the subtlety of Rembrandt as a printmaker who employed a wide range of subject matter, processes, and materials. Etchings by the 17th-century Dutch master are presented through the lenses of connoisseurship, scholarly and public reception, and the history of collection-building, as well as technical and scientific approaches, such as the analysis of watermarks in the paper on which the etchings were printed. Rembrandt Harmensz. van Rijn (Dutch, 1606–1669), "Self-Portrait Leaning on a Stone Sill," showing Basilisk watermark, 1639. Etching, with touches of drypoint; retouched in black chalk. Collection of Yale University Art Gallery. Transmitted light photograph courtesy of Theresa Fairbanks-Harris. Lines of Inquiry: Learning from Rembrandt’s Etchings includes stellar impressions of Rembrandt’s etchings on loan from Cornell, Harvard, Princeton, Vassar, Syracuse, Yale, the University of Kansas, the Morgan Library & Museum, and private collections. The exhibition is curated jointly by Oberlin’s Curator of European and American Art Andaleeb Badiee Banta and Andrew C. Weislogel, the Seymour R. Askin, Jr. ’47 Curator of Earlier European and American Art at Cornell. Rembrandt Harmensz. van Rijn (Dutch, 1606–1669), Jan Six, 1647. Etching, engraving, and drypoint. Collection of the Frances Lehman Loeb Art Center, Vassar College. The accompanying catalogue presents new research on initiatives that examine the enduring status of Rembrandt as a printmaker and the multivalent nature of his works. It includes an overview of the history of Rembrandt prints in American academic collections, a documented account of the Allen Memorial Art Museum's secret guardianship of the Morgan Library & Museum’s collection of Rembrandt etchings during World War II, and an introduction to Cornell University’s Watermark Identification in Rembrandt Etchings (WIRE) project, which is dedicated to digitally facilitating access to Rembrandt watermark scholarship.